There is a land of serenity and peacefulness, of gentle breezes and cheerful song, where everything is in total harmony. It is a world apart. Quiet. Dreamy. Timeless. This idyllic place is Old North State -a private lakefront community located in the Piedmont region of North Carolina, amid the pristine Uwharrie National Forest and tranquil Badin Lake, just an hour's drive from Charlotte, Greensboro, and Winston-Salem. Old North State's location makes it unique among exclusive gated properties. It sits on a peninsula surrounded by a lake and primal woods that have barely changed in decades. Because almost one-third of Badin Lake's 115 miles of shoreline is protected from development by the adjacent Uwharrie National Forest, it will remain that way for decades to come. A beautiful setting is only part of the Old North State story. Inside the gates lies a vibrant community composed of caring individuals who enjoy playing, working, and relaxing together. Many activities center around the members-only Old North State Club with its championship Tom Fazio golf course and other recreational amenities including tennis courts, swimming pools, fitness center, lakefront guest lodge, marina, and full service clubhouse. Homes within Old North State are carefully integrated into the natural landscape and reflect many architectural styles and periods. Most are spacious single family dwellings. But there are also grand estates and luxurious town homes. Depending on the location, you may have a magnificent water, golf course, or wooded view. People choose Old North State for many different reasons. A second home... a retirement retreat... a full-time residence. This diversity keeps the community vital. 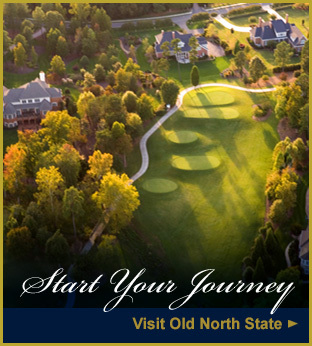 When you visit us, you'll quickly realize that Old North State is not just a community-it's a lifestyle. A place where serenity is unspoiled, and there are 950 acres of possibility among impossible beauty. Stay abreast of what's available at Old North State. Enter your email address below and we'll let you know as soon as properties come on the market.